Add filters, effects, and soundtracks to videos you create on your iPhone with the simple, intuitive FrameBlast iPhone app. Since the FrameBlast iPhone app does not have an in-app camera, the developers at FlameBlast LTD have clearly devoted energy and resources to streamlining the interface for editing tools accessible to most users. The FrameBlast iPhone app opens to a clean, dark screen with three circular-shaped icons. You can record, blast, and check out blasts. The record screen is tight and efficient. Your video is a thumbnail shot in the middle of the top of the screen. Just below the video, you will find a horizontal menu bar with three options–select a tune, record now, and select videos. With a touch on the select videos icon, a matrix grid of your iPhone camera roll’s videos is displayed. You touch the videos you want to include, and the FrameBlast iPhone app automatically identifies and edits snippets from each video. If you want to change the order of snippets, then you touch the adjust icon next to the photo’s thumbnail. You use horizontal swipes on thumbnail images to move from the beginning of the video to the end, and you use vertical swipes to scroll through each scene. With a tap on a new scene, you can change the order. You can add music through two processes. You can tap the select a tune icon, or you can use the music that complements the video’s filter and effect. If you want to select music from your iPhone music library, then you must tap select a tune. Currently, you can choose from seven video filters. The filters are chic and modern, and Snapseed, Hipstamatic, and Instagram users will find some choices that are familiar and appealing. There are black and white, as well as bright, light-filled choices. One of the coolest aspects of the FrameBlast iPhone app is the ability to move back and forth with the tools and functions quickly. You are not required to move step by step in a linear process. You can adjust filters, play your video, and then adjust the video. You can start with a filter, then pick and choose your videos. The interface almost demands creativity. 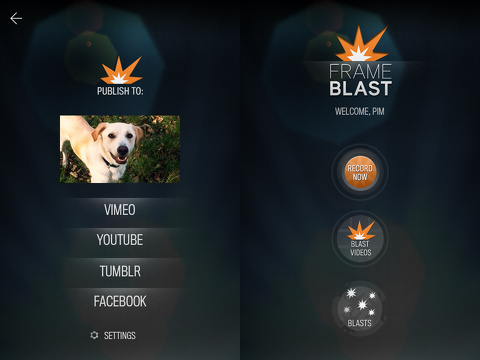 When you have completed your FrameBlast, you can share to Vimeo, YouTube, Tumblr, and Facebook. 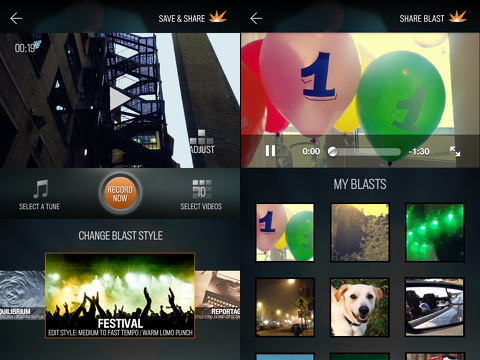 The FrameBlast iPhone app adds a bit of finesse and fun to your iPhone videos for free. AppSafari review of FrameBlast was written by Jenni Ward on January 8th, 2013 and categorized under App Store, Free, Fun, Utilities, Video. Page viewed 4018 times, 2 so far today. Need help on using these apps? Please read the Help Page.